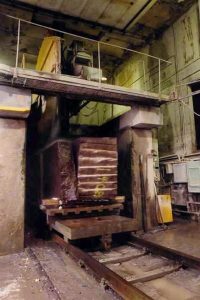 Granite Importers Inc. is a natural stone fabrication business located in Barre, Vermont, home of one of the largest granite quarries in the world. Granite Importers Inc was founded in 1971 by Jake Colgan. In the late 1940’s after finishing his military service Jake joined his father-in-law Everett Williamson at Williamson Polishing where his lifetime in the granite industry began. He later purchased the company and quickly expanded the business. Jake later went on to importing blocks for the monument business in Barre. Along with new colors of granite he also was the first to bring diamond cutting technology to the USA. Diamonds rapidly became the standard in the stone industry throughout the country. Accompanied by a small handful of partners, Jake revolutionized the stone trade, and they are all known as pioneers in the industry. Through constant growth and expansion, Granite Importers evolved into a FULLY DEVELOPED ARCHITECTURAL STONE FABRICATOR specializing in cubic work, special moldings, columns, steps, coping, paving, veneer, and more. Our work can be seen scattered all across the world. We listen to our architect’s and mason’s needs and work with them to come up with the best solution. We know it is essential to have the stone on-site and on time in order to keep masons and general contractors on schedule; our manufacturing reflects this. We understand that sometimes replacement pieces are needed and so they are manufactured and expedited immediately to fulfill you and/or your customer’s needs. If the delivery truck cannot make the schedule, we will personally deliver the materials. We have over 40 years of experience making us very efficient fabricators and are regularly cutting lead times in half. Our work is of the highest quality and we stand behind it 100%. We take pride in our customer service and we keep our customers promptly updated with job progression. We have outstanding relationships with quarries and the most dependable trucking companies. From design to delivery we demonstrate a higher level of customer service and a collective knowledge of the industry that is unsurpassed. 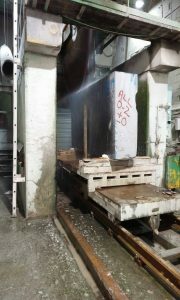 We offer complete fabrication services from budgeting for design development to engineering, anchorage design, drafting, fabrication and delivery of finished stone. Our employees are dedicated craftsmen all of whom are highly skilled and versatile, which allows us to manufacture as a team. Our employees are irreplaceable and we can’t thank them enough for their dedication. Two 12 foot diamond circular saws able to cut up to 5 foot high panels. Taller panels are cut with our wire saw. Any thickness is possible from 3/4 inch and up. Manufacturing equipment designed to allow any size or shape. Polishing beds are large enough to finish panels up to 18 feet by 12 feet (weight is the limiting factor). Honed, Steeled, Sandblasted, Flamed, and Hand Tooled finishes are also available. Circular Saws, Grinders, Planer, Lathe, Edging Machine, Hand Grinders and Drills allow great flexibility in fabrication.